Well, not really, but they are not as effective as they used to be. Our attention spans are diminishing by the day, and no one has time to read your eBook. Phase 1: Something is worth paying for – an eBook. When you pay for it, you read every last word, take notes, and put things into action. Phase 2: That same thing is not worth paying for anymore, but you’ll give up your contact information to get it. When you get it, you’ll still take the time to skim read, jot down a few points, and put something into action. Phase 3: That popup is annoying you, but if you see it enough times you’ll give up your email address to download the eBook. When you do, you won’t even open the email with the eBook in it. On the off chance you do open that email, you won’t read it and it will gather dust on your desktop. Phase 4 (where we are now): Why would you download an eBook? There is more in-depth information on their blog anyway, and that popup is annoying you. In fact, you may not come back to this website. Think about it for a second … you’re in phase 4, aren’t you — unwilling to download an ebook, even if you find the topic relevant and interesting? So why is your business still offering boring incentives to capture leads? People are immune to this type of lead generation because they’ve seen it all too much before. The great thing for you is that your competitors are still relying on these outdated tactics to attract leads, so you can stand out by doing something different. Contests are an interactive way to capture your audience’s attention, tickle their inquisitive side, and persuade them to hand over their contact information. The rest of this article will provide a list of high-performing contest marketing examples that will help you use contests as a way to acquire new leads. Key events that occur throughout the year are great opportunities to run a contest and engage your audience. They are topical and newsworthy which piques people’s interest and persuades them to participate. 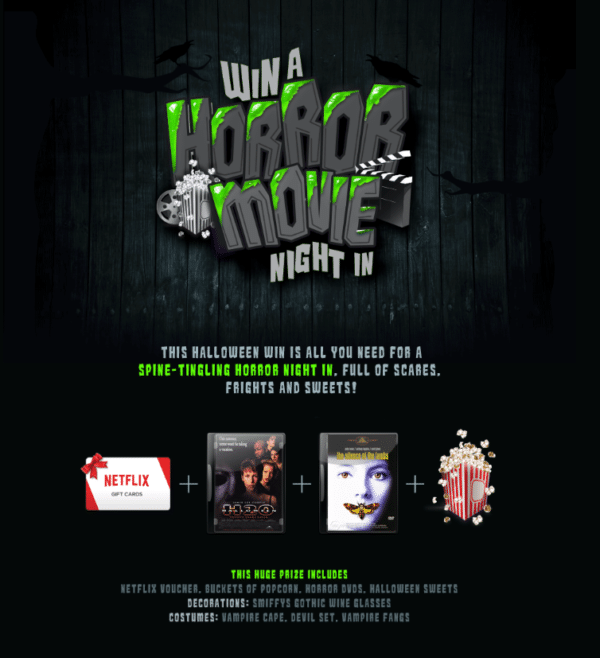 This contest makes the most of Halloween by offering participants a “Spine-tingling horror night in.” In this example, the prize includes buckets of popcorn, a Netflix voucher, horror DVDs, Halloween sweets, decorations, and costumes. If you were already planning a Halloween movie night, why not try your hand at winning this contest? Halloween Movie Night Contest Example. What better way to generate interest at Easter time than a good ‘ol fashion Easter egg hunt! 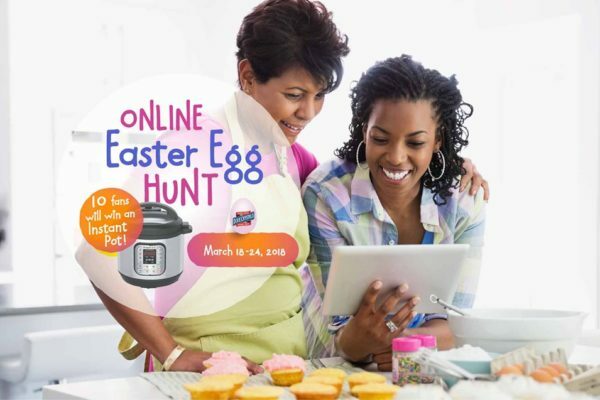 This contest takes a popular tradition and brings it to the digital world by leaving an online trail leading to Easter recipes. Easter Egg Hunt Contest Example. The day of love, Valentine’s Day, is a perfect contest opportunity for any business that bring couples closer together. 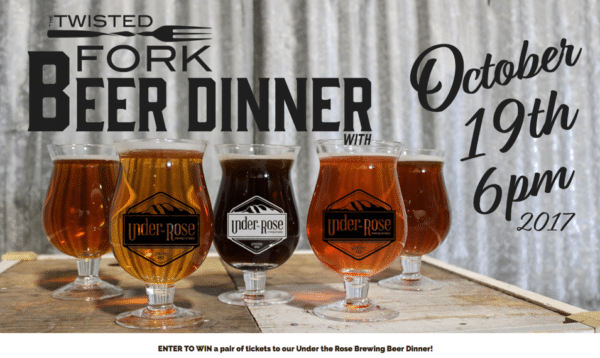 Whether you own a restaurant, sell flowers online, or are a jeweler, like the example below, this event-based contest is bound to generate interest and leads. Valentine’s Day Jeweler Contest Example. The only problem with contests like the above examples is that your competitors might leverage the same events to run contests of their own. 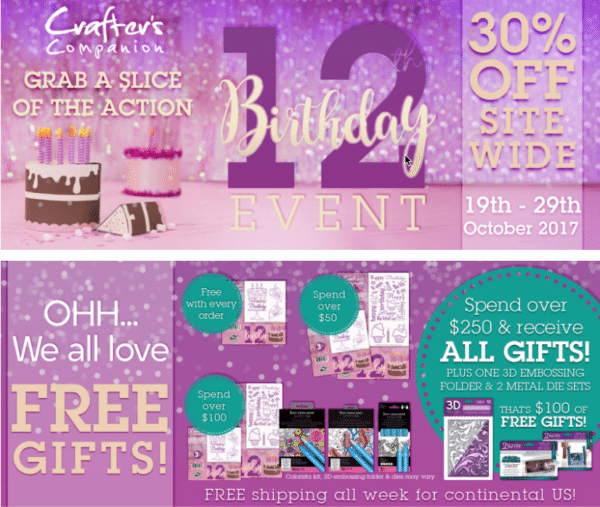 One event that is unique to your business is your “Birthday.” The day you started out as a business. A poll is an interactive way to get valuable information from your prospective customers by asking them simple multiple-choice questions. This information can give you insights into their opinions, desires, and interests. Or you can use this strategy to encourage contest participants to “Pick a Prize,” which is a popular tactic to increase conversions. 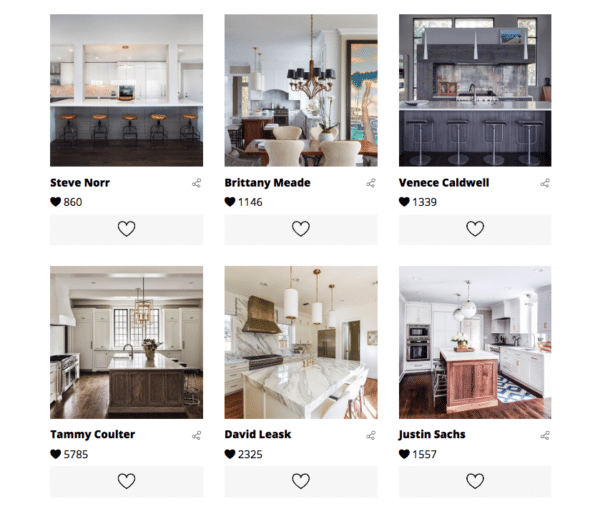 This creative contest example from Thermador kitchens encourages participants to vote for the kitchen design that suits their style with the chance to win up to $500 in prizes. A great way to get user-generated feedback from your customers. 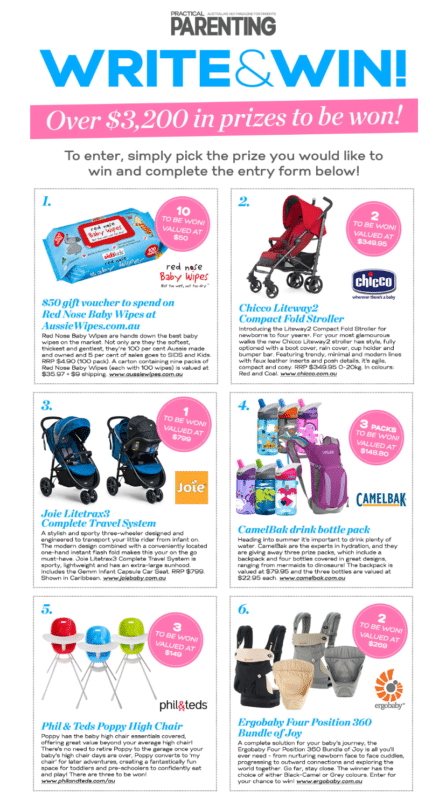 With six choices of prizes, this polling contest from Practical Parenting shows how you can use this form of interactive marketing to find out which products your customers are most likely to buy. 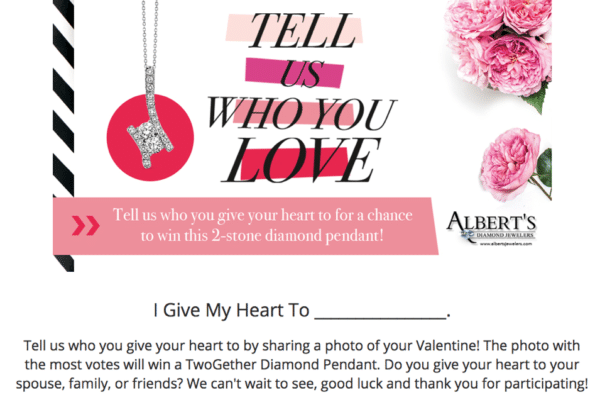 Below is an example of a contest that combines the event-based attraction of Valentine’s Day with the interactivity of a poll. Who wouldn’t want to pick their own present? 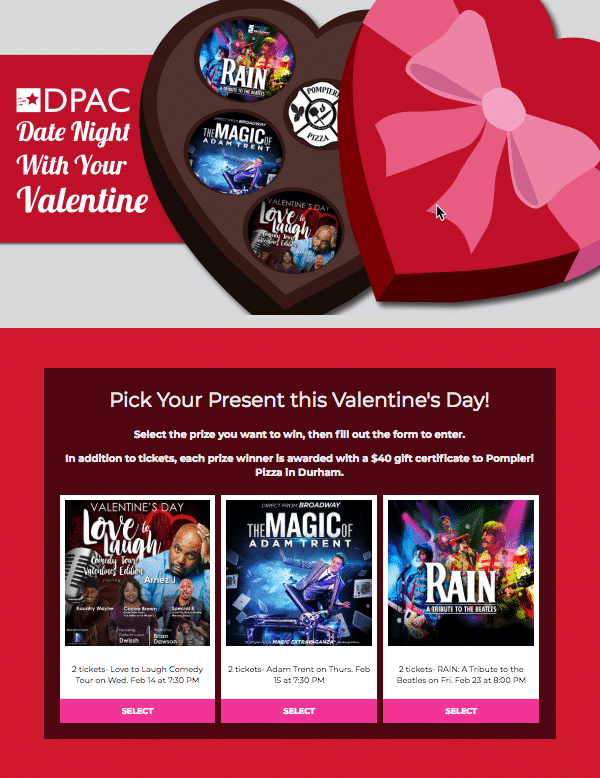 Especially when the options are shows that are perfect for Valentine’s date night. 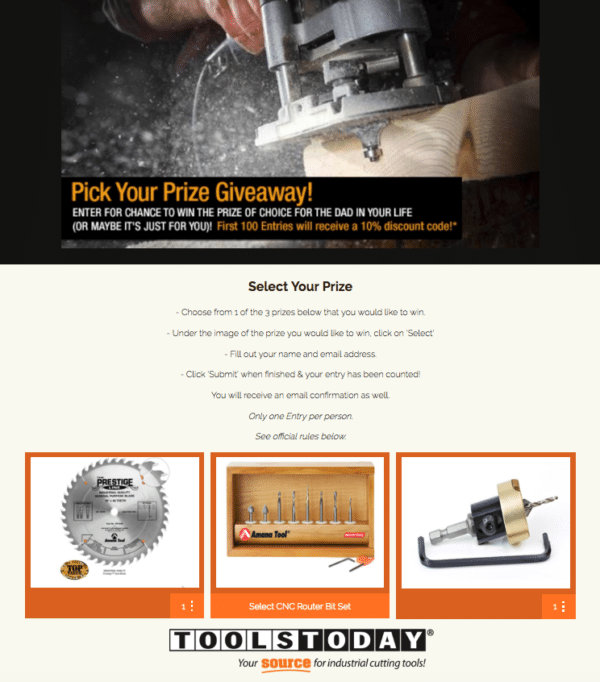 Leading on from the hybrid contest strategy used below is an example from Tools Today, who have jumped on the Father’s Day bandwagon to run a pick-a-prize contest for their power tools. Before closing out the section on polls, let’s look at one more example from gourmet deli provider Abeles & Heymann. Unlike most contests that give away the primary product of a business, this contest has shown off the company’s true understanding of their customers by giving away prizes that complement their main offering (deli meats). Abeles & Heymann Contest Example. A giveaway is an interactive and fun way to attract leads by offering them the chance to win a prize with a high perceived value. The winner is usually chosen at random from a pool of participants. Everyone is familiar with travel-related prizes. Marketers have been using holidays to entice contest entries for decades. They’re universally attractive prizes that you can almost guarantee people will give up their details for. The main downfall to having airfare, hotel stays or other travel, as a giveaway prize is that they are quite generic and don’t really narrow your target audience down. 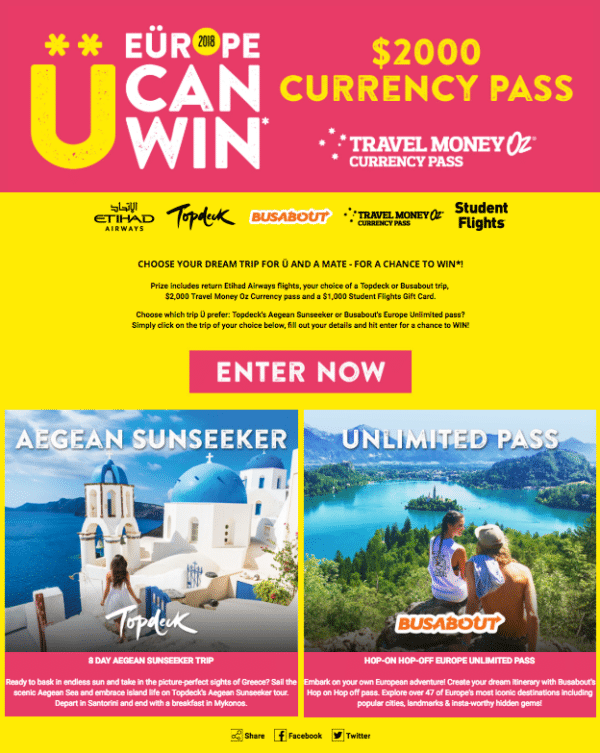 Unless, of course, you are are in the travel industry like the contest example below for a trip to Europe, sponsored by Topdeck, Etihad, Busabout, Travel Money, and Student Flights. 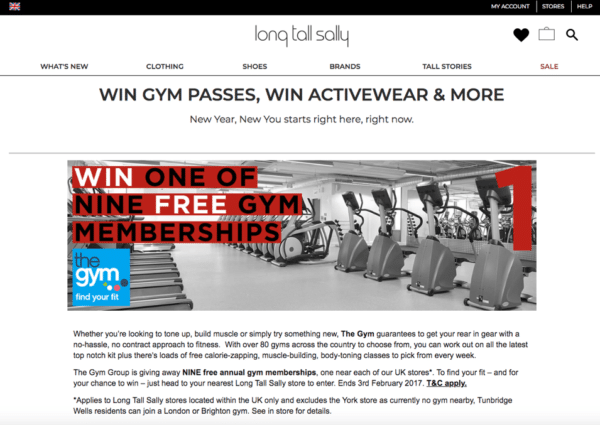 UK activewear company Long Tall Sally used the concept of a complementary contest prize by giving away a gym membership, rather than the easy-win of giving away free products. 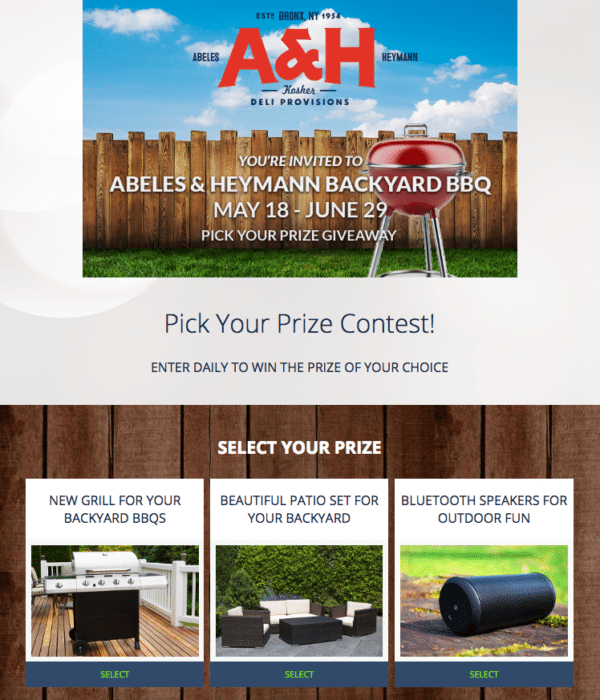 This example is unique because they have embedded the contest entry form on their eCommerce website, rather than using a standalone landing page. Long Tall Sally Contest Example. Next, we’ve got a giveaway run by a fresh food and grocery store that is offering a $20 gift card. 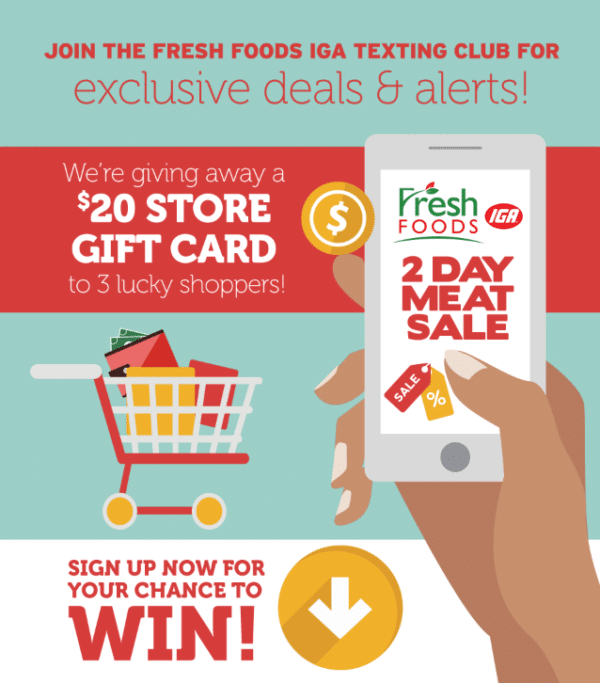 This piece of contest marketing is being used to encourage sign-ups to the company’s SMS texting club. If you plan on shopping at this store then $20 off your next grocery bill is an attractive price. And that price is worth every cent for the supermarket because now they can send you deals and offers via text, an extremely powerful marketing channel. To wrap up this section of the article on giveaways it’s worth looking at an example that is a little different. Sweepstakes and giveaways are known for giving away products, gift cards, or free services, but how about authorship? 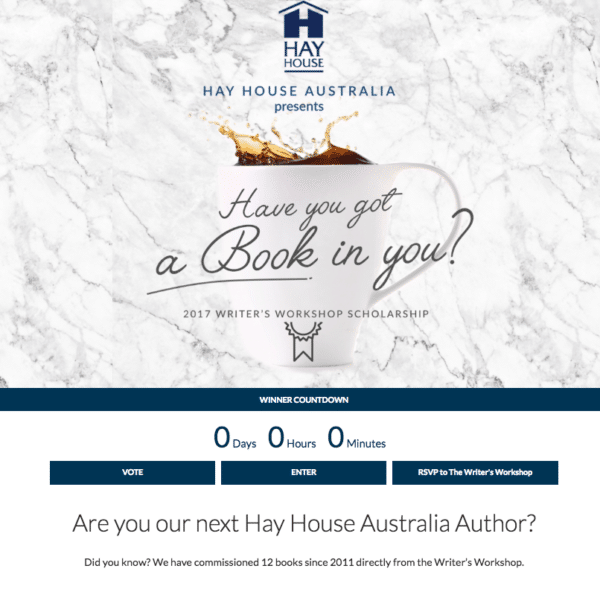 Hay House Australia got creative with their contest prize by offering an author scholarship to the winner. Hay House Australia Contest Example. 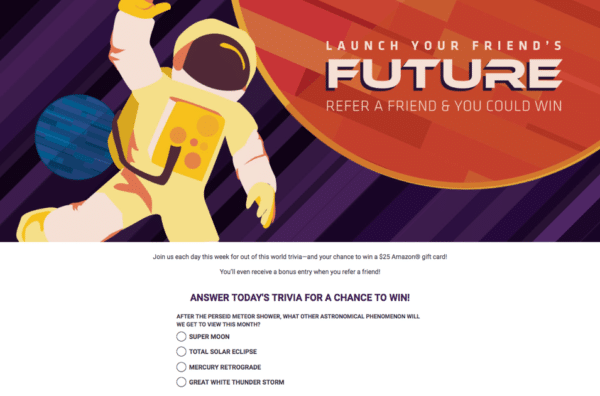 Quizzes and trivia contests are a great way to create a personal connection with your customers. Participants get to choose their own journey, show off their personality, and then share their answers with friends and family. They have built-in virality when it comes to sharing! 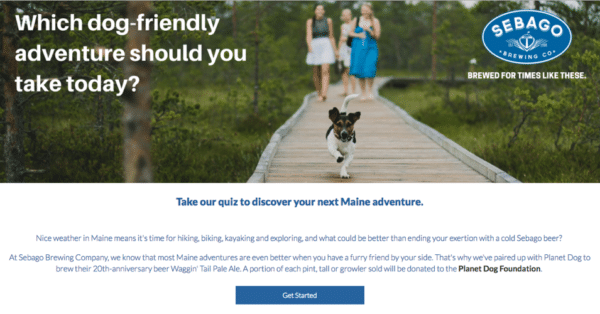 For this quiz, Sebago Brewing Company partnered with Planet Dog to ask targeted questions to dog owners in Maine about their lifestyle. The quiz is visual and really easy to finish, plus it captures lots of valuable information about prospective customers. 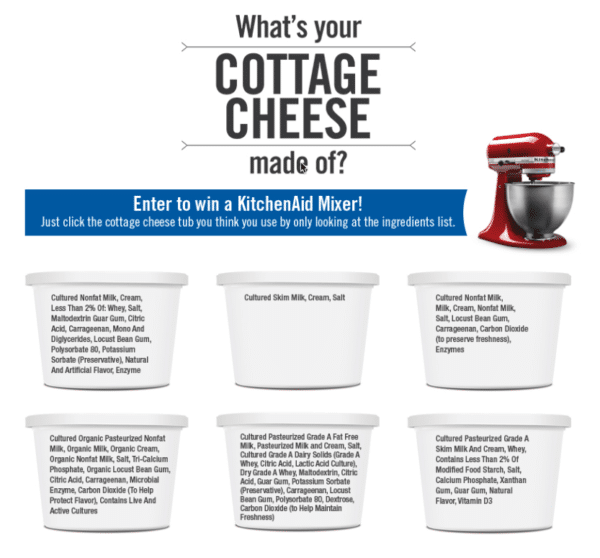 Below you will see that KitchenAid has taken a quirky approach to their contest about cottage cheese. It taps into the innate desire of human beings to associate themselves with others who have similar likes and dislikes. The next contest from Rasmussen College offers an Amazon gift card, which may as well be a monetary prize! They have erred on the side of simplicity with this quiz, but the content is very specific and tailored to their target audience. 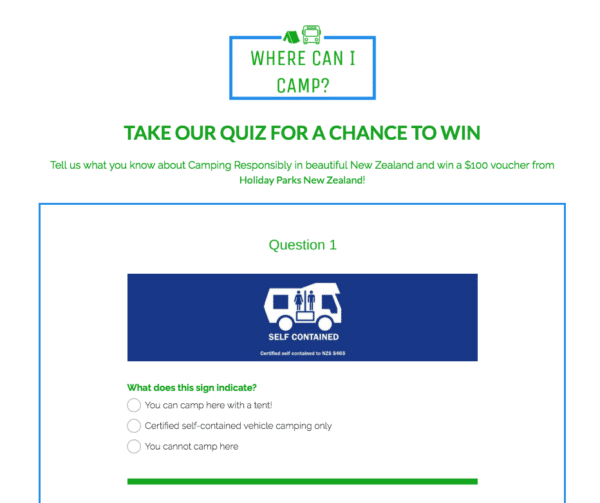 This quiz example by Holiday Parks New Zealand does a great job of qualifying participants by asking specific and targeted questions that only a certain type of person would be able to answer. Jarlsberg uses a short and sharp picture-quiz for their contest below. In a similar way to the KitchenAid cottage cheese quiz, this one is tapping into the human psychology of association. 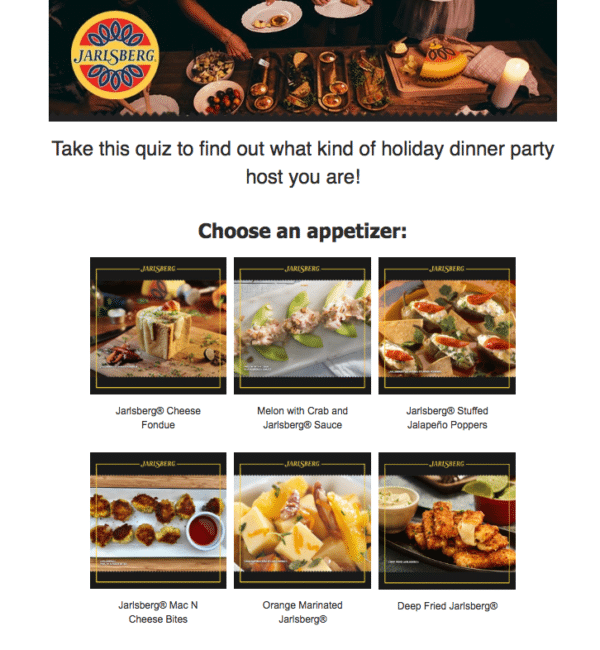 Wouldn’t you want to find out what kind of holiday dinner party host you are? 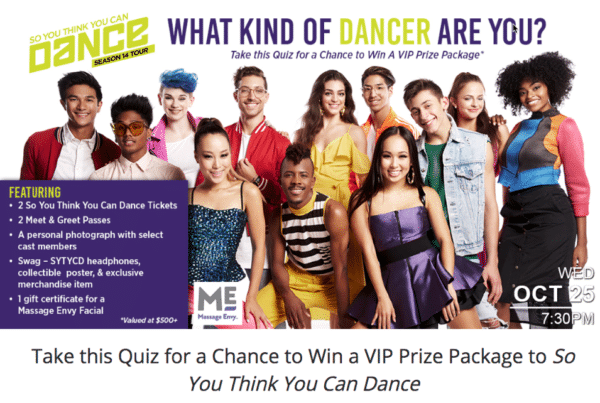 Last but not least, we’ve got a contest marketing example from the popular TV show “So You Think You Can Dance.” The prize is a VIP event package for the show, and the quiz is a quick image-click, 3-option quiz, that is super easy to complete. Not to mention it looks visually stunning as well. So You Think You Can Dance Contest Example. Contests provide an interactive way of engaging your audience, collecting leads, and increasing your digital presence. They are a significant upgrade on outdated lead-generation tactics such as eBook downloads. But you don’t need to go away and try every one of these. Instead, use them as inspiration to find the type of contest that will connect with your audience. Which contest marketing example caught your attention?